Mission team members were thrilled—if not a little surprised –that the New Horizons’ telescopic Long Range Reconnaissance Imager (LORRI) was able to see the small, dim object while still more than 100 million miles away from it, and against a dense background of stars. Taken Aug. 16 and transmitted home through NASA’s Deep Space Network over the following days, the set of 48 images marked the team’s first attempt to find Ultima with the spacecraft’s own cameras. This first detection is important because the observations New Horizons makes of Ultima over the next four months will help the mission team refine the spacecraft’s course toward a closest approach to Ultima, at 12:33 a.m. EST on Jan. 1, 2019. That Ultima was where mission scientists expected it to be—in precisely the spot they predicted, using data gathered by the Hubble Space Telescope—indicates the team already has a good idea of Ultima’s orbit. 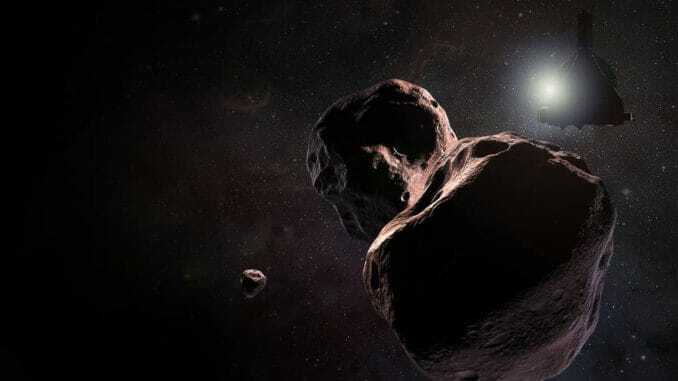 The name “Ultima Thule” was selected from some 15,000 names for this object, submitted in a public contest. Thule was the place located furthest north, which was mentioned in ancient Greek and Roman literature and cartography. In classical and medieval literature, Ultima Thule (Latin “furthermost Thule”) acquired a metaphorical meaning of any distant place located beyond the borders of the known world. By the late middle ages and early modern era, the Greco-Roman Thule was often identified with the real Iceland or Greenland. Sometimes Ultima Thule was a Latin name for Greenland, when Thule was used for Iceland. In 1910, the explorer Knud Rasmussen established a missionary and trading post in northwestern Greenland, which he named “Thule”.